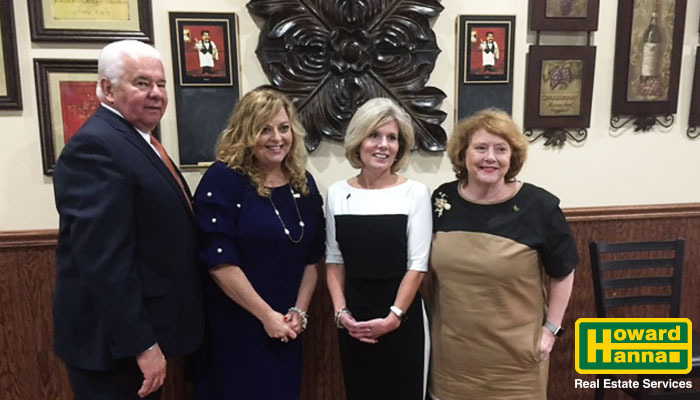 Monroeville, PA (June 4, 2018) – At a luncheon held for the agents of the Howard Hanna Real Estate Services’ East Suburban/Monroeville offices at DeNunzio’s in Monroeville on June 1, 2018, Vice President and East Regional Manager Yvonne Guthrie and PA President Tom Ceponis announced that Denise Serbin has been named the Sales Director of the of the East Suburban/Monroeville offices. With more than 29 years of experience in sales and customer relations, Serbin has been a licensed Realtor in the Howard Hanna Shadyside office and one of the office’s top producers. She is a Homes of Distinction Specialist, a National Sales Excellence Awardee, and a member of Howard Hanna’s Champions Club. Additionally, she served as a co-chair of the Shadyside office’s annual “Choo Choo Chow Chow” fundraiser benefitting the Free Care Fund at Children’s Hospital of Pittsburgh. “Denise’s great attitude, vision, and commitment will lead the East Suburban/Monroeville offices to new levels and an even greater presence in the eastern suburban markets of the Pittsburgh region,” said Yvonne Guthrie. A native of Pittsburgh, Serbin lives in Regent Square and has an extensive knowledge of Pittsburgh neighborhoods and the current real estate market. She is a member of the National Association of Realtors, Pennsylvania Association of Realtors, and the Realtors Association of Metropolitan Pittsburgh. “I am very excited to join these two dynamic Howard Hanna offices, and I am very honored to be a part of leading all of these incredible agents to new heights,” added Serbin. The Howard Hanna East Suburban office is located in Forest Hills at 2120 Ardmore Boulevard; the Howard Hanna Monroeville office is located at 4321 Northern Pike in Monroeville. For all of your real estate needs, or to join the growing Howard Hanna team, Denise Serbin can be reached at 412-271-7600, 412-856-8800, on her cell phone at 412-480-6554, or by email at deniseserbin@howardhanna.com.